Find the cheapest EWR parking rates by using the search bar below. 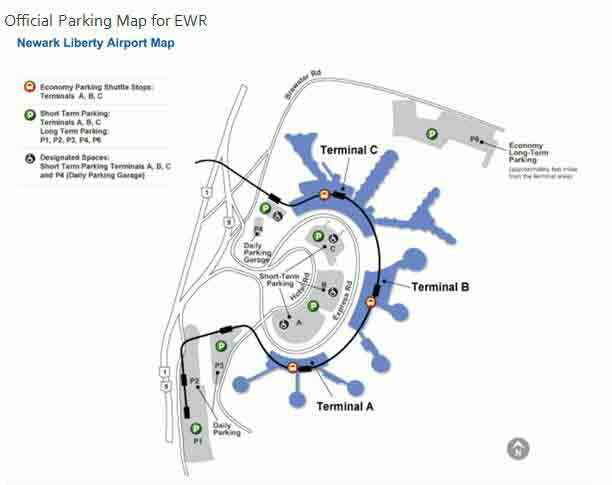 Which lot is best for Newark Airport short term parking? The best lot for EWR short term parking is the Terminal C Garage. Lots across from Terminal A and Terminal B also offer competitive rates for short-term parking. Please refer to the short-term parking rates table below for more information on EWR parking. What are the rates for Newark Airport short term parking lots? Terminal C garage has the best EWR parking rates at $4 for every 30 min. Hourly EWR parking is also offered at the Terminal C garage at a rate of $8 per hour. Daily parking lots (P1, P3, and Garage P4) also offer parking at the same rates: $4 per 30 min and $8 per hour. Is there any free parking at Newark Airport? Yes, Newark airport parking is free at the Cell Phone waiting area, located near the airport's entrance and adjacent to the P4 Parking garage. There is cheap EWR parking in the Terminal C garage for $4 every 30 min and $8 per hour. You can also check the EWR parking rates tables below to see what rates are offered by the airport. Off-site Newark airport parking is the best alternative and has the best rates. Where can I park for Newark Airport long-term parking? Terminal C Garage offers long term EWR parking, along with lots P1, P3, and Garage P4. Economy parking (Lot P6) also offers long term Newark airport parking at a better rate. Off-site Newark airport parking lots also offer long-term parking at more affordable rates. What are the rates for Newark Airport long-term parking? Off-site EWR long term parking is about $6-$10 daily and will always be the more affordable option for EWR parking. Onsite parking at Newark Airport is $18 daily at the Economy parking (Lot P6), $27/$34 daily at lots P1, P3, and Garage P4, and $39 daily at Terminal C.
Are shuttles offered for Newark Airport long-term parking? Shuttles for EWR parking are offered at all off-site long-term airport parking lots. Shuttles to and from Newark airport are free and run about every 20 minutes. Most shuttles operate 24 hours a day, 7 days a week, in all weather conditions. Can Newark Airport parking be reserved? Yes! Just visit way.com to reserve your Newark Airport parking space today! Where can I find Newark Airport Parking discounts and coupons? You can find cheap EWR parking and deals through websites and apps like Way.com, Groupon, RetailMeNot, and Ebates. You can also find up to date news and events on the official Newark airport parking page. Where is Newark Airport located? Newark airport is located at 3 Brewster Rd, NJ – 07114. Newark airport can also be contacted by calling (908)-787-0667.